In a shallow stainless steel saucepan, dissolve the sugar in the water over a low heat, then add the orange juice and bring to the boil. Add half of the prepared rhubarb and simmer over a gentle heat for about 5 minutes, until just tender but holding its shape. Using a slotted spoon, remove and transfer to a shallow bowl. Repeat with the second half of the rhubarb. Blend the arrowroot with the 2 teaspoons of cold water, then stir into the warm syrup and bring to the boil. Cook gently, stirring, until the mixture clears and thickens. Add this sauce to the bowl of rhubarb, mix gently and leave to cool. When ready to serve, place the meringue nests on a serving plate or place one or two meringues on individual dessert plates. Place a spoonful of whipped cream in each meringue nest, then arrange some rhubarb pieces and sauce on top and around the nests. Sprinkle with crystallised orange zest, if using. 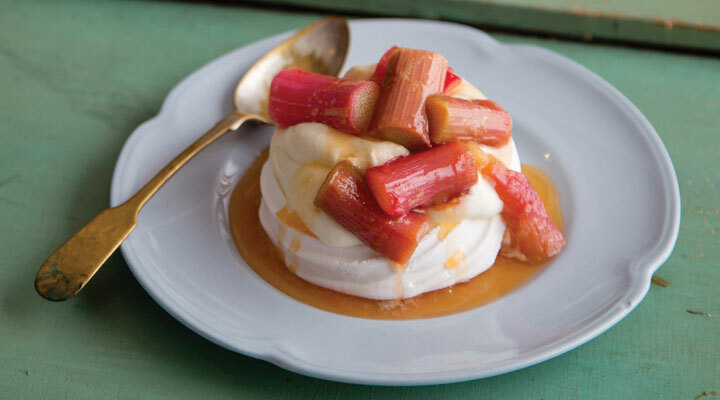 Serve any remaining rhubarb and cream separately, or if you have any broken meringues, use them to make up a simple rhubarb Eton mess.